IÂ don’t know if Douglas Coupland changed my life. If not, he came close. Douglas Coupland is the author of Microserfs, a fictional tale of life at Microsoft in the mid-1990s. I had to have read Microserfs before December 1998, because according to my Amazon’s history that’s when I read Coupland’s Girlfriend in a Coma. I read Microserfs, and wanted to be with those people, to know those friends, to live that life. JPod is an update that takes place a decade later and two hours to the north, in Vancouver, British Columbia. JPod is not a copy of Microserfs, but the books definitely ‘rhyme.’ JPod also takes place in the world after the 9/11 attacks, which are never directly mentioned, but appear to lurk behind the surface. Microserfs was a work of techno-optimism, and ends with the what might be the most moving description of transhumanism I ever read. The world of JPod is subtly darker and more violent. We no longer live in a world where the young do not have a war to support, oppose, and think about. They now have too many. But JPod’s tone is funny, the antics more absurd than in Microserfs, and follows a stream-of-consciousness style. There’s plenty of geek humor too — if a technical manual that identifies .cpp (C++) files as “containing information about films that won an Academy Award” is hilarious, this may be the book for you. 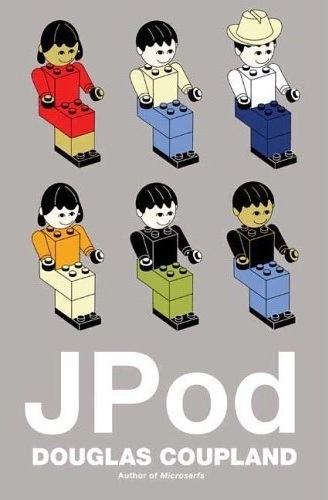 JPod is recommended for fans of Douglas Coupland and Microserfs.